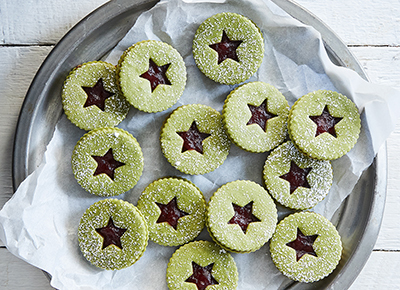 The holidays are all about tradition—but when you’ve made your great-grandmother’s same cookie recipe for the past 20 years, there’s also something to be said for jazzing things up. So we took classics like sugar cookies, gingerbread cookies and Linzer cookies and gave them mega upgrades. The results are chic, stylish and guaranteed to be the most popular dessert at your holiday party. Crushed-up sugar cookies coated in white chocolate. Need we say more? Let’s be honest: Who’s really a fan of those crunchy gingerbread men? But these gooey treats are a different story. Whoa, the traditional German sweet just got a major upgrade. Make the dough ahead of time and bake ’em whenever. Ditch the sprinkles. Weaving your cookies is so 2017. Way more interesting than plain old jam. They’re like magical airy clouds.